MacDonald was an original founder of the NJSGA Caddie Scholarship Foundation and its chairman from 1957 to 1967. He was a member of Rock Spring Club and Baltusrol, a member of the Scottish Trust, and a recipient of the British Royal Order of Merit. He enlisted in the Royal Canadian Air Force at the outbreak of World War I, became a fighter pilot in England and was shot down, surviving the crash, but suffering multiple injuries. In 1920, he joined the New York firm of Thomas and Betts which produces electric connectors and accessories. 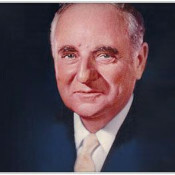 Starting as a salesman, he rose to company president (1955), CEO (1960), and Board Chairman (1965). He is remembered as one of the great benefactors in New Jersey golf history and today a full four-year scholarship to Rutgers University is named in his honor.